Supercritical fluid extraction (SFE) of plutonium in its nitrate form from actual waste, i.e. plutonium bearing cellulose matrix was demonstrated using 0.1 litre capacity extraction vessel. 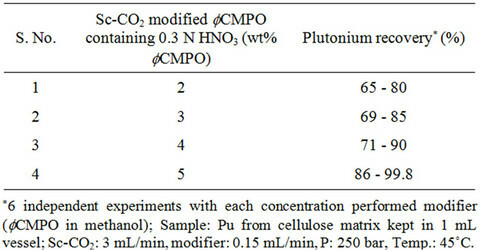 Complete recovery of plutonium was demonstrated using modified supercritical carbon dioxide (Sc-CO2), i.e. Sc-CO2 containing octylphenyl-N, N-diisobutyl-carbamoylmethylphosphine oxide (fCMPO). Near complete recovery of uranium was demonstrated from simulated waste matrices, i.e. uranium bearing teflon, glass and cellulose matrices using preparative scale SFE, i.e. from 1 litre capacity extraction vessel. The recovery of uranium was established using Sc-CO2 modified with acetyl acetone. In recent years, Supercritical fluid extraction (SFE) has emerged as a powerful technique in the extraction of various metal ions from diverse waste matrices and as an alternative technique to solvent extraction. Liquid like density and gas like transport properties of supercritical fluids make them unique to act as special solvents. Supercritical fluids offer faster, efficient and cleaner extraction of compounds of interest with minimum generation of secondary liquid waste as CO2 escapes as gas after the extraction, leaving the solute in its pure form [1-3]. CO2 has a low critical temperature (31.2˚C) and a moderate critical pressure of 73.8 bar. It is non-flammable, non-toxic and environmentally friendly. CO2 being a non polar molecule, can be mainly employed for the extraction of non-polar and moderately polar compounds. Direct extraction of metal ions with supercritical carbon dioxide (Sc-CO2) is not possible because of weak solute-solvent interactions and charge neutralization requirement . The extraction of metal ions is achieved by modifying the properties of carbon dioxide, i.e. mixing carbon dioxide with appropriate extractants or chelating agents. A major requirement for the use of a ligand as chelating agent in SFE is that the ligand and resulting metal chelate should have sufficient solubility in Sc-CO2 medium [4,5]. Removal of various long lived radionuclides from waste is of major concern in nuclear industry. Various organic materials such as polymers, rubbers and cellulose, widely used in nuclear industry and research facilities are prone to be contaminated with various radioactive materials. Several techniques such as solid phase extraction, solvent cleaning etc., are used for decontamination of radionuclide from waste matrices. However, these techniques result in the generation of secondary liquid waste, which requires further treatment. SFE is an alternative and attractive technique for recovery of actinides from such waste matrices since it reduces the generation of secondary liquid waste. 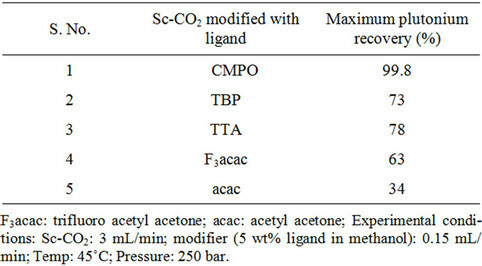 Supercritical carbon dioxide modified with ligands was employed for the extraction of various metal ions such as transition metal ions, lanthanides and actinides from different media [4-20]. The extraction of lanthanides and actinides was carried out using Sc-CO2 modified with b-diketones . Supercritical fluid extraction of uranium and plutonium from nitric acid medium was examined using Sc-CO2 containing tri-n-butyl phosphate (TBP) . Quantitative dissolution of uranium dioxide in Sc-CO2 containing TBP with nitric acid was reported [9-10]. Uranium dioxide and its solid solutions with neptunium, plutonium and americium dioxides were dissolved using Sc-CO2 modified with TBP/nitric acid . 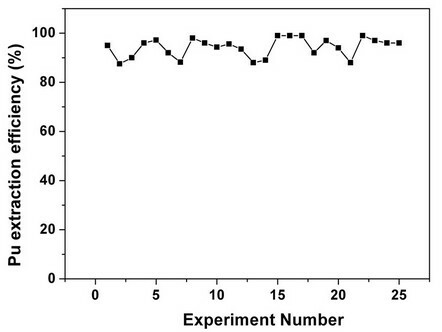 Supercritical fluid extraction of plutonium and americium from surrogate soil was investigated using Sc-CO2 modified with theonyltrifluoroacetone (TTA) and TBP ; the extraction efficiencies of Pu and Am were found to be 69% and 88%, respectively. Sc-CO2 containing hexafluoroacetylacetone and pyridine was employed for the removal of actinides from stainless steel surface . Complete removal of uranium from simulated solid waste matrices, e.g. tissue paper matrix was demonstrated in our laboratory using modified Sc-CO2 . In our earlier studies, complete recovery of plutonium from simulated waste matrices such as tissue, glass, teflon and stainless steel was demonstrated using Sc-CO2 modified with octylphenyl-N, N-diisobutyl-carbamoylmethylphosphine oxide (fCMPO) in methanol . In all these investigations, an analytical scale SFE was carried out, i.e. extraction from 1 mL capacity vessel. The actual waste generated in the laboratory, when subjected to SFE for the recovery of actinides resulted in an incomplete extraction. It was observed that the extraction efficiency of actinides from actual waste matrices (e.g. cellulose matrix) was highly influenced by the parameters such as storage period, nature of actinide species, moisture content etc. In the present study, SFE of plutonium was carried out from the actual waste i.e. cellulose based waste matrix using a 0.1 litre capacity extraction vessel. 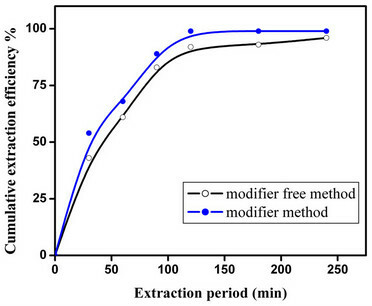 The extraction efficiency was investigated as a function of ligand and its content in modifier, temperature, HNO3 content in the Sc-CO2 phase and extraction time. Initially the recovery of plutonium was carried out using a 1 mL extraction vessel and methods were evolved for the complete removal of plutonium from actual cellulose matrix. Subsequently, the plutonium bearing waste was processed using a 0.1 litre capacity extraction vessel. Similarly, the recovery of uranium was investigated in a preparative scale SFE facility, extraction vessel of 1 litre capacity. The recovery of uranium was investigated from different simulated waste matrices viz., cellulose, teflon and glass, which are generally encountered in various process steps in a radioactive laboratory. The results on the recovery of actinides from these waste matrices are discussed. The SFE system (M/S Jasco) used consists of two reciprocating pumps, one with peltier cooling for pumping carbon dioxide and another pump for the delivery of modifier, a constant temperature oven (±1˚C) and a backpressure regulator. Carbon dioxide gas used was of supercritical grade i.e. 99.9%. The SFE system was setup in a glove box for the recovery of plutonium from waste matrices . Extraction vessels of 1 mL and 0.1 litre capacities were employed for loading the sample. The 0.1 litre capacity (11 cm height × 4 cm dia) extraction vessel was designed and fabricated at our laboratory. The glove box facility was developed incorporating modifications required for handling high pressures and isolated electrical connections. A secondary container accommodated the primary extraction vessel so that any accidental pressure release can be contained causing no disturbance to the maintenance of an appropriate negative pressure of the glove box. Various in-built safety measures and associated alarm annunciation facilities were established to avoid over-pressurising of the system during its operation . The two pumps used for the delivery of liquid carbon dioxide and the modifier (extractant in methanol) were placed outside the glove box. However the backpressure regulator and heating oven, which accommodated the extraction vessel were kept inside the glove box. The “extracted sample collection system” was also arranged inside the glove box and plutonium was sampled for assay. In the initial experiments, 1 mL capacity extraction vessel was employed to optimize the SFE conditions for efficient recovery of plutonium from waste matrix. The cellulose based matrix containing plutonium in its nitrate form was cut into small pieces, typical dimension being 5 × 10 cm. 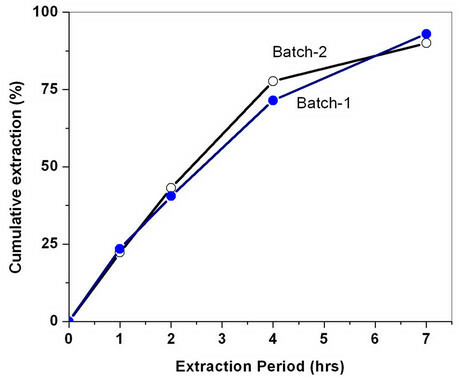 The cut pieces were inserted into a 1mL extraction vessel, 1N HNO3 (100 mL) was sprinkled and extraction was carried out under typical conditions viz., pressure: 250 bar, temp: 45˚C, Sc-CO2 flow rate: 3 mL/min, methanol flow rate: 0.15 mL/min; ligand content: ~5 wt% ligand in methanol, about 1.8 mL of HNO3 added to 100 mL solution of methanol containing suitable ligand. The extraction was carried out for a period of 2 hrs. The plutonium present in extract was collected in small volume of dil.HNO3 + isopropanol medium. The plutonium contents of the extract after the SFE experiment was assayed by liquid scintillation technique. The remains i.e. un-extracted plutonium in cellulose waste matrix was estimated by leaching with 4N HNO3. The leaching efficiency using ultrasonication was established earlier in our laboratory and was found to be >98% . After the initial studies, the plutonium bearing waste was taken after cutting it into small pieces in to a 0.1 litre SFE vessel and extraction was carried out. Figure 3. Co-solvent-free delivery of fCMPO for supercritical fluid extraction and recovery of plutonium from cellulose waste matrix. Experimental: Sc-CO2: 3 mL/min; P: 250 bar; Temperature: 45˚C; Extraction vessel capacity: 1 mL; Sample: cellulose waste with plutonium. Co-solvent method: Modifier (5 g fCMPO and 1.8 mL 16N HNO3 in 100 mL methanol) flow rate: 0.15 mL/min; Co-solvent free method: fCMPO (equilibrated with 4N HNO3) delivery ~50 mg/hr. Table 2. Recovery of uranium from simulated waste matrices. In each run, ~2 g uranyl nitrate was loaded on to various matrices. hours extraction was carried out for the recovery. In another set of experiments, the extraction was carried out at a Sc-CO2 flow rate of 40 g/min for about seven hours; the extraction efficiency was found to be between 90% - 93%. In another experiment, the concentration of acetyl acetone was doubled i.e. 6 wt% acetyl acetone in methanol and extraction was done for 4 hrs duration. In these experiments, extraction efficiency of about 80% - 85% was achieved. 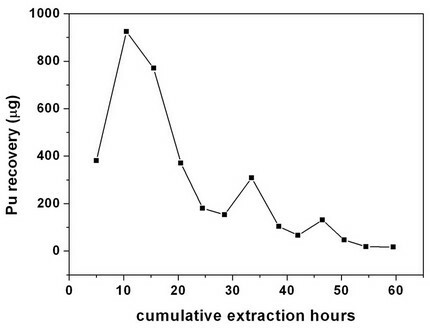 The extraction profile for the recovery of uranium from cellulose matrix is shown in Figure 4. These studies have established that Sc-CO2 flow rate and acetyl acetone composition in the methanol can be varied to achieve near complete recovery of uranium from waste matrix. 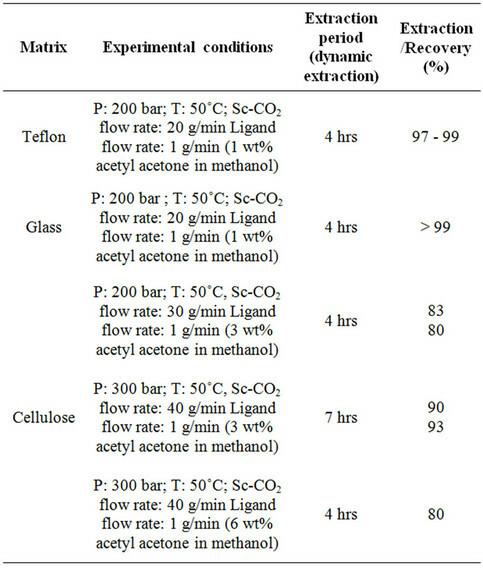 The complete recovery of uranium from teflon and glass matrices (~99%) compared to cellulose matrix has established interaction between uranyl ion with cellulose matrix, leading to some reduction in the extraction efficiency under identical conditions. Our future endeavors include minimization, recovery and reuse of extractans, which are employed with CO2 for the recovery of actinides from various waste matrices. Our future investigations include use of optimum/minimum pressure and temperature with the preparative scale SFE facility for the recovery of actinides from various matrices. Figure 4. Supercritical fluid extraction and recovery of uranium from simulated cellulose waste matrix. Experimental conditions: P: 300 bar; Temp. : 50˚C; Sc-CO2: 40 g/min; modifier: 3 wt% acetyl acetone in methanol: 1 mL/min. Extraction vessel capacity: 1 litre; Sample: simulated cellulose waste containing uranium. lulose waste. These studies established that SFE basedtechnique provides an excellent alternative to recover the actinides with minimum generation of secondary liquid waste. The investigations to establish the complete extraction of actinides from waste matrices can lead to various other possible applications in the fuel cycle program. T.G. Srinivasan would like to acknowledge with thanks The Department of Atomic Energy, India for the award of Raja Ramanna Fellowship. M. Caude and D. Thiebaut, “Practical Supercritical Fluid Chromatography and Extraction,” Harwood Academic Publishers, Switzerland, 1999. M. A. Mc-Hugh and V. J. Krukonis, “Supercritical Fluid Extraction: Principle and Practice,” 2nd Edition, Butterworth-Heinamann, Boston, 1994. A. Datta, N. Sivaraman, T. G. Srinivasan and P. R. Vasudeva Rao, “Liquid Chromatographic Behaviour of Actinides and Lanthanides on Monolith Supports,” Radiochimica Acta, Vol. 99, No. 5, 2011, pp. 275-283.